Major Vijay Rattan Chowdhary was born on 9th July 1939 in Ambala district of Haryana. Son of Dr. MD Chowdhary, Major Vijay Rattan Chowdhary was commissioned into 7 Engineers of Madras Engineering Group on 14th December 1958. On 11th December, 1971, Major Vijay Rattan Chowdhary was in charge of clearing minefield laid by the Pakistani army meant to forbid the movement of Indian army. The movement of tanks was disrupted near Chakra town when a trawler got bogged down in the nullah running across a minefield. At the same time, the Pakistanis were regrouping to launch a counter-attack on the captured town of Chakra. Therefore it became very important that the movement of traffic across the minefield was restored. Major Chowdhary swung into action and commenced the work of clearing the lane despite coming under heavy enemy fire. Displaying utter disregard for his personal safety, Maj Chowdhary personally supervised the work, moving from man to man, giving instructions. Owing to his courage and exceptional leadership, the traffic was restored and tanks and other vehicles could move into the town, despite heavy enemy fire. Maj Chowdhary also cleared major minefields at Thakurdwara Lohra and Basantar river, in addition to one at Chakra spanning 1000 to 1500 yards. While supervising the clearance of minefield lane near Basantar river, Maj Chowdhary was hit by enemy artillery fire and was martyred. Major V R Chowdhary was awarded the “Maha Vir Chakra” for his extraordinary courage, unyielding fighting spirit and supreme sacrifice. 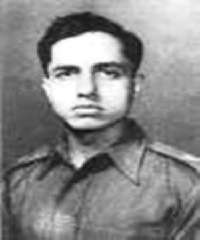 Major V R Chowdhary was in charge of minefield clearance of Chakra on the Western Front. The safe lanes had to be made with great speed to enable our tanks and anti-tank weapons to reach Chakra, which was in imminent danger of a counterattack by enemy armour. With utter disregard for his personal safety, Major Chowdhary personally supervised the operation, inspiring and motivating his men to their optimum efficiency. Throughout the advance, from 5 December onwards, Major Chowdhary displayed exemplary devotion to duty and was responsible for clearance of minefields of 1,000-1,500 yards depth at Thakurdwara, Lohra and Basantar River. While supervising the minefield lane near Basantar River this gallant officer was killed due to enemy artillery fire. Major V R Chowdhary’s exceptional devotion to duty, extraordinary bravery, inspiring leadership and supreme sacrifice was in the highest traditions of the Army. You always be Saluted for your Patriotism, Conspicuous Courage and Supreme Sacrifice to the Mother land. Your suprem sacrifice will be always be remembered sir..